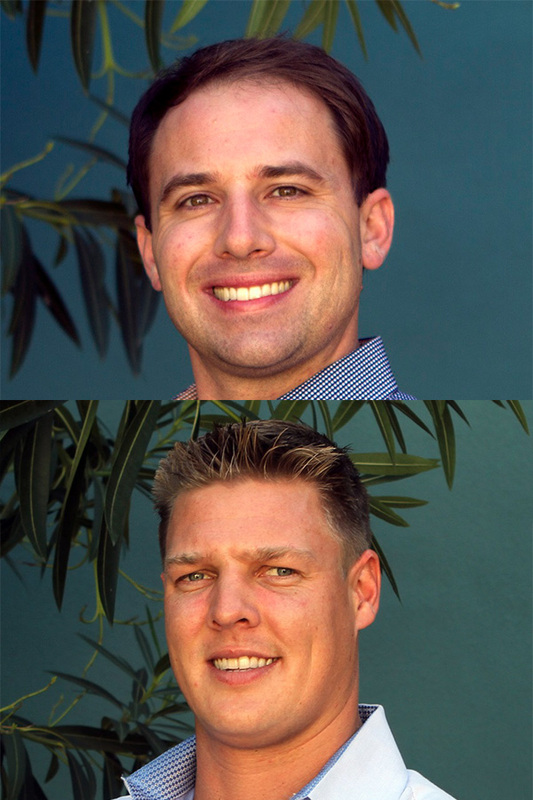 In just three years since starting a business together, marketing graduates Michael DeGiorgio, ’10, and Erek Benz, ’08, have grown Commercial Real Estate Exchange Inc. into an online multimillion-dollar business with more than 40 employees and have expanded the Los Angeles-based company to New York and Miami. The company stands out as a leader in its industry because it assists commercial brokers while entertaining real estate offers using innovative technology to simplify and expedite the transaction process. The key advantage over competitors is the company’s ability to use cutting-edge, data-driven metrics so buyers and sellers can easily track listings. Because of their leadership and outstanding success, the NIU Alumni Association has chosen Benz and DeGiorgio as the recipients of the 2018 Outstanding Young Alumni Award. Benz, a walk-on NIU football player, started his first company, Position-Tech, with fellow alumni after graduating. He had the idea to make customizable football cleats when he was challenged in an NIU entrepreneurship class to develop a start-up company. The cleat was unique because it could be customized to each football position and was designed to enhance the speed and agility of a player. Benz and his team partnered with the NIU College of Engineering and Engineering Technology to test the product and were able to create a pendulum-like device that mimicked the movement of an athlete dragging the cleat through artificial turf. Once the design was ready, they hit the road in rented minivans, which doubled as hotel rooms, and made cold calls daily, resulting in $53,000 in sales. After being sold in retail stores and to NCAA and National Football League teams, they arranged a deal with Champ/MacNeill Engineering Worldwide to manufacture and distribute the cleats and expand the technology to other sports. Benz then moved to California to work with his classmate, DeGiorgio, at Auction.com, which was one of the first to create a digital real estate platform. In 2014, DeGiorgio lost his mother to liver cancer and felt compelled to start his own business. With the encouragement of his father, he decided to pursue his dream, and both DeGiorgio and Benz quit their jobs to begin a business plan for CREXi. One of DeGiorgio’s favorite NIU memories was watching Benz build Position-Tech and make the cleats in his basement. He also enjoyed learning from marketing instructor Ed Brata and doing all the team building exercises that were part of the marketing program. Barsema Hall was a favorite place for him because he remembers really enjoying learning and being around people with similar ambitions and goals. Beyond that, it was all the little things that he learned at NIU that have made a big difference in his success, such as how to present yourself, how to dress and putting customers first. Another favorite place during college was River Heights Golf Course, where he would play early in the morning with NIU friend and CREXi teammate Lawson Dees. For Benz, Barsema Hall was also a favorite place to hang out because it provided a great environment to learn and grow. NIU management instructor Eric Wasowicz has been the biggest influence in his career.